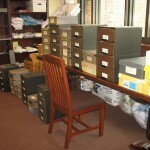 In 2011 the archives acquired a group of photographic material from the Office of Communications. Since then a succession* of diligent archives student assistants have worked steadily to place the contact sheets and negatives together in high quality sleeves, transfer information from the old filing sleeves, and then to store them in hanging file drawers for ease of access. Actually, many people** at IWU deserve the thanks of all future IWU photo seekers. Below are a few then-and-now pictures to give a sense of this effort. 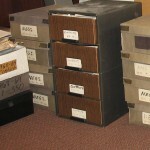 The years spanned in these image files are 1966-2002, though the bulk of the negatives are from 1970s-1990s. A rough estimate of the total comes to about 40,000 images. Some information is searchable in a database (available in the archives) created by a couple of generations of photographers, but most images are at least in chronological order and correspond with activities that occur regularly each academic year. This order itself, even without complete descriptions, is significant for the work of the archives in satisfying the many research inquiries we receive each year. 2011: Many, not all, of the contacts and negatives boxes. 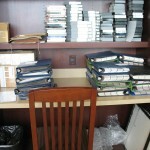 2011: Close up of contacts and negatives boxes. 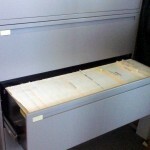 2011: Books of slides. Other slides came in boxes and carousels as well as cabinets with hanging files. 2011: One of the slide cabinets. 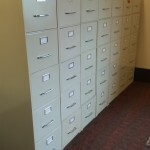 2015: A row of filing cabinets containing most, but not all, of the photographic files now available for research requests. 2015: Close up of contact sheets and negatives, matched by archives assistants, labeled with original info, and suspended in file cabinets. * Students (now alumni!) assisting in this project were Kaylee, Kenny, Kirsten, Melissa, Rachel, Shirley, and Tia. **Special thanks to the photographers who took the images and saved their log books, Physical Plant for moving everything so carefully, and University Librarian Karen Schmidt for making it possible to purchase the supplies that will help keep our history safe and in order for future use! Karen also alerted me to the policies of State Farm that allow non-profits to acquire used furniture from their surplus warehouse. 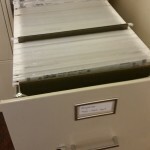 We wouldn’t have all the vertical file cabinets without them! This entry was posted in Alumni, Campus Administration, Campus units, Departmental histories, Faculty, Research files, Students and tagged Archives, photographs, primary sources by Meg Miner. Bookmark the permalink.